The towers of San Gimignano, perched on a pretty Tuscan hilltop, are one of the most magnificent and unusual views pilgrims will encounter as they make their way along the Via Francigena trail. The medieval skyscrapers of San Gimignano are a fascinating reminder of the might and power of local feuding families in the Middle Ages: between the 11th and 13th century wealthy merchant and noble families, the Ardinghelli and the Salvucci, built 72 tower houses in a game of ‘keeping up with the Jones’, in true medieval-style. The towers were built by the families as a symbol of their wealth and some of them used to be as high as 54 metres, which was quite an achievement in those days. The higher the tower, the more important and respected the family; or so they thought! 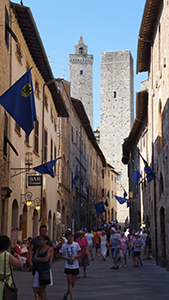 It is also believed San Gimignano’s quarreling families and their towers gave Shakespeare the perfect backdrop for the plot in Romeo and Juliet. 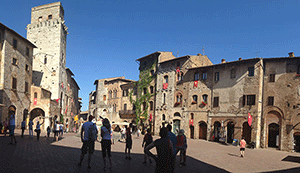 The walled town of San Gimignano would flourish and grow around the two main squares during the 12th and 13th century. 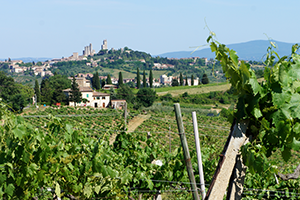 In the 14th century, however the town and its wealthy families went into economic decline, the population decimated and San Gimignano would lose its independence to be again under the control of neighbouring Florence. Economic woes did have a silver lining as they would spare San Gimignano from further development in later years, helping preserve its medieval essence and keeping its architecture and unique charm intact. Today, pilgrims and tourists flock to San Gimignano to admire the 14 remaining towers; proudly included in the UNESCO list of world heritage sites. The Piazza della Cisterna, the square of the well; and Piazza Duomo, the Cathedral Square are a must-see; as well as the cathedral, home to several art masterpieces dating back to the 14th and 15th centuries. The famous towers also give the town the nickname of ‘San Gigmignano delle belle Torri’, San Gimignano of the beautiful towers. Dominating the surrounding Tuscan landscape, these iconic medieval skyscraper are quite a mighty sight today and it is easy to imagine how impressive they would have looked to pilgrims on their way to Rome along the Via Francigena back in the Middle Ages. San Gimignano of the beautiful towers is on section 14 if you are walking the Via Francigena to Siena (the most popular walking section of the trail); section 7 if you are cycling the Via Francigena.